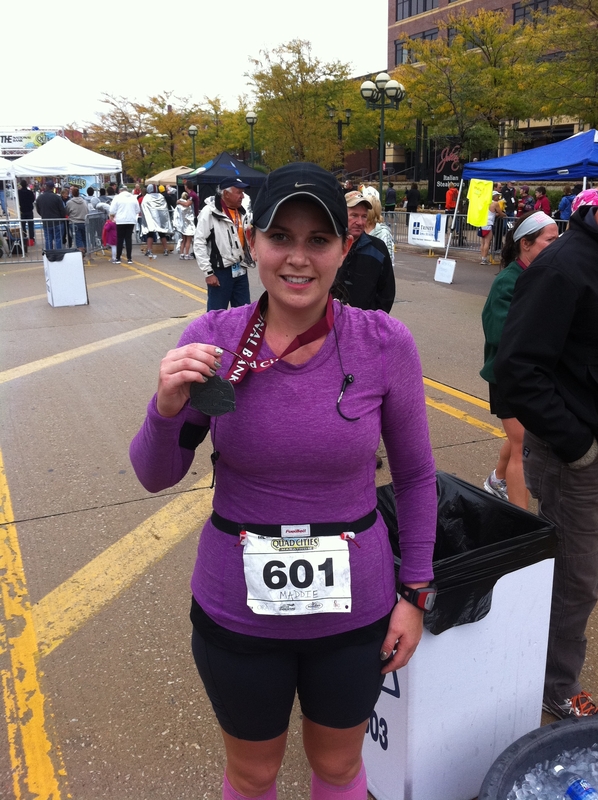 Me, the girl who swore off running, I ran 26.2 miles. I ran my first half marathon back in November 2009. I remember finishing that race thinking, “I will NEVER do that again.” Two more half marathons, a hand full of various short races, and a push from my brother finally made me decide to make the commitment to run my very first 26.2 miles. 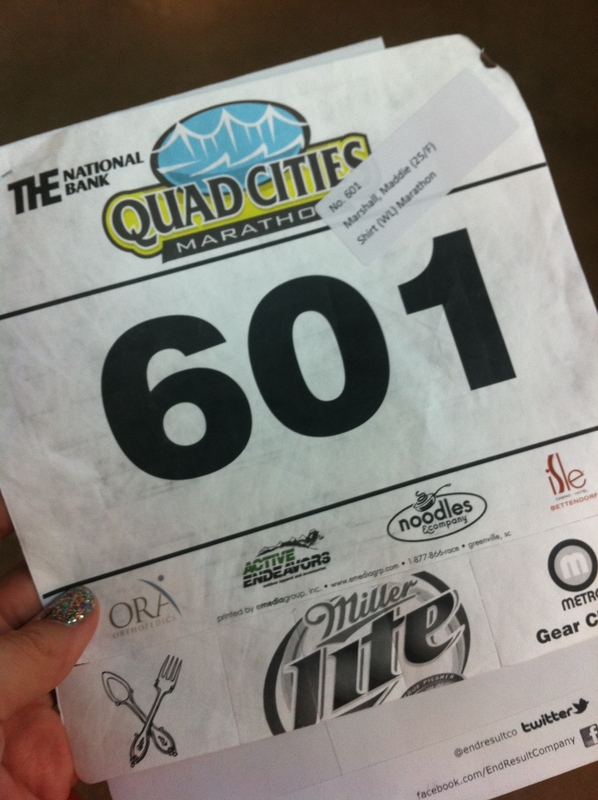 Taking a page from Ironman David, I too ran the Quad Cities Marathon. The whole Marshall Family piled into the car Saturday morning and made our way up to Moline, IL. First stop was the Race Expo for race bibs, shirts, and goodie bags. Did I mention that Mom, Dad, and brother were running the half marathon? Afterwards, we had a pre-race dinner of IHOP two-by-two-by-two’s & Chik-Fil-A. (Surprisingly more healthy than you’d think.) Pancakes are definitely a way to go as far as carbs. Soon after that, a quick walk-through one of the Quad City malls, and we were back at the hotel prepping for the next morning. Running note: I have found that carbo-loading should be done TWO days before your big race. It gives you time to properly digest and hydrate. The dinner before your race should also be carbs, but not nearly as much. The next morning was RACE DAY! And what a cloudy and cold day it was! With temperatures in the 50’s, it was a glorious day to go for a run! Gun time was 7:30am. Since both half and full marathoners had simultaneous starts, I got to run with my brother for the first mile, and then my mom for the next seven. Dad took off with his snazzy shoes and his steady pace. This was his second race, ever. 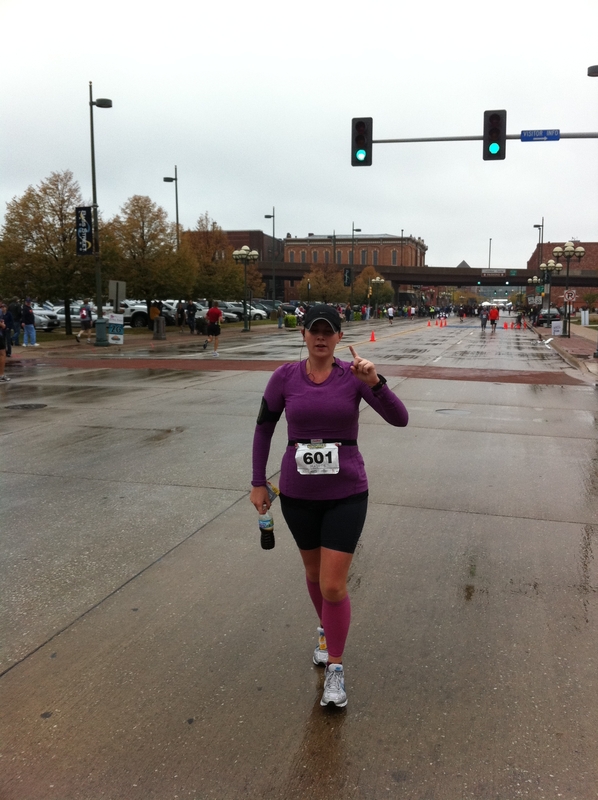 It was fun running with my mom; we made faces at the race photographers and shot down mile markers as we passed them. After she and I split to continue our separate courses, I enjoyed the scenery as I plugged along. I loved running near the water and crossing the various bridges that connected all the cities. Cloudy skies become rain sprinkles, and then by mile 14 the skies let loose! For six straight miles it POURED…and it was awesome. I finally saw my family at mile 20 and it was the best feeling in the world. They couldn’t believe my good spirits and that I had actually made it that far without walking! My brother handed me a Coke for some energy and calories, and ran with me for a quarter of a mile, just like I did with him during Ironman. He gave me some advice for the last six miles, wished me luck, and told me he’d greet me at the finish, as a marathoner. Running a marathon is no doubt the most incredible thing I have done in my life. The amount of time, training, and dedication it takes to do one is completely worth every emotion that happens during the race. Crossing the finish line is something I will never forget. I wore my medal on Monday morning, not just to show everyone I ran a race, but so I could feel the medal around my neck and let it sink in that I indeed ran a marathon. I was asked quite a number of times if I “won” since I received a medal. My answer was yes. I beat myself at a race that few have done, and many never dream of completing. I ran a marathon. Awesome job, and nicely written recap! Hooray, Maddie! So proud of you! Congrats! I saw your blog on SR! First marathon! YOU DID AMAZING! Wow, watching that video, you sure did finish strong. And looked so cute (p.s. I love your nail polish in the bib pic). And I think it’s so neat that your whole family runs. I wish some of mine did. Thank you so much. I really appreciate you saying that. So awesome! I am running my first full in a week and a half (and I ran my first half about 5 weeks ago). Congrats!!!! That is SO exciting!! Good luck! Just know that it doesn’t matter if a thousand people pass you and you come in last. You are running a MARATHON, and that accomplishment will be with you for the rest of your life. Can’t wait to hear about it! Love this Maddie!!! “I beat myself at a race that few have done, and many never dream of completing. I ran a marathon.” – what a true quote!!! And did I see that you are indeed running RnR??? RnR Marathon here I come!!! 🙂 Thank you so much! Congrats on finsihing your first marathon. I still remember the feeling I had after I crossed the finish line of my first marathon, it is a feeling you will never forget. Congrats! It’s a mixture of amazement and disbelief. I will never forget it either. Thank you!! Amazing! I just stumbled across your blog from SkinnyRunner’s site. I have completed one half marathon and have 4 more planned over the next year. A full marathon is on my goal list but so daunting…thank you for this inspirational, motivating post! Congrats!!!! I thought it would be daunting too, trust me! Half marathons are an awesome starting point! They are a great distance. I loved doing the full. I hope you do one, in a weird way, it will change your life. It will show you how hard of a worker you can be to train and accomplish those 26.2 miles! Enjoy every mile of it! The biggest advice that I can pass along is have your race day nutrition! Oh, and don’t be afraid if you have to stop and use the bathroom! lol. It’s the most grueling and rewarding thing you will probably do in your life. I can’t wait to hear about it! Good luck!!! Thank you! I don’t consider myself to be inspiring. I just love it when people tell me they are running! Thanks for reading! Good luck! It’s so exciting!! I can’t wait to hear about it! All your hard work will pay off, I promise! Congrats!!! I found your blog through skinnyrunner. I just completed a half marathon two weeks ago and am signed up for a full end of November. If you took Gus or gels during your run, how many did you do? And at what miles? Also, how many weeks did you train for? Congratulations!! That’s so exciting! I actually was turned onto EFS Liquid Shot by my brother. http://bit.ly/onpwbY I carried two flasks with me. Each flask equals 400 calories & has the consistency of pudding. I burned around 3,330 cals during the marathon, so energy is essential! The race I did had an aid station every other mile, so as I was coming up on one, I would take a couple of sips of it and then follow it with a full cup of water. I tried to have half of a flask every hour. Make sure you practice with whatever you are going to use on your long runs! And it’s okay to stop and go to the bathroom, it means you are hydrated! I trained for the marathon for about 2-3 months. I’ve been a runner for a couple of years now, so it just meant uping the distance on weekends. If your race is in November, you should probably be hitting your 20 mile outing in the middle of October and then begin to taper. Feel free to email me: maddie@cityinajar.com with more questions!! Can’t wait to hear about your race! congrats! i read about your story from skinnyrunner.com …i just ran my first half and am signed up for the paris marathon in april! Paris?!! Um, jealous! I can’t wait to hear all about that one! How Exciting!! I am new to running, so YOU are an inspiration to ME!! 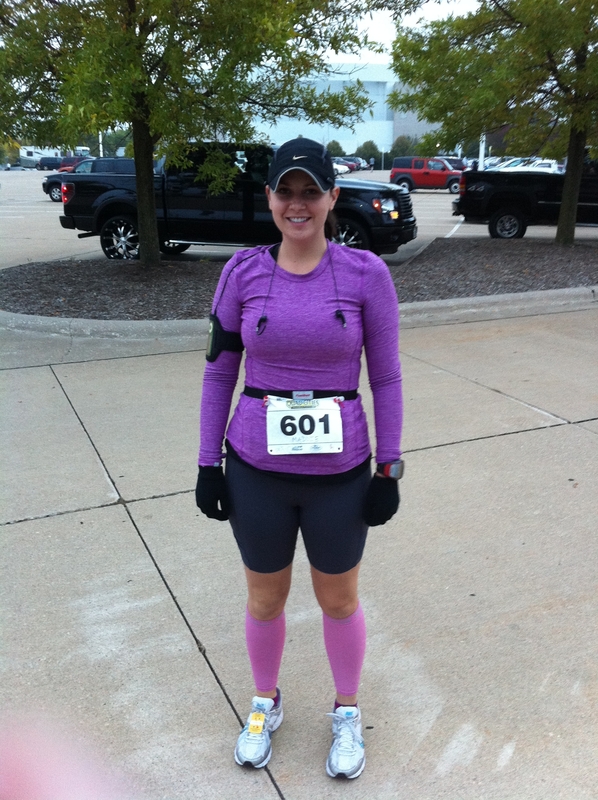 Can I ask you, how long from when you first started running to run your first 1/2 marathon?? Sadly, I can only run 2 miles right now 😦 but I’m not giving up!! You GO GIRL!!!! First of all, be proud of yourself that you can run two miles! That’s incredible. Most people can’t even run that. I started training about 3 months before my first half. I HATED running back then. HATED it. I will say, the biggest motivator is signing up and paying an entrance fee for a race. It gives you something to strive for: putting your money where your mouth is. What race are you thinking of doing?